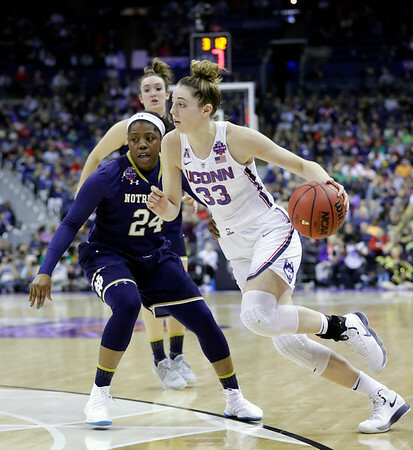 Two-time reigning AAC Player of the Year Katie Lou Samuelson said she is practicing in full six months after surgery on her left ankle repaired shredded ligaments and a torn tendon. Samuelson was named the AAC preseason Player of the Year for the first time during the AAC media day. In 32 games as a junior, she averaged 17.4 points and career-highs of 4.5 rebounds and 3.8 assists. She had surgery on April 12 after playing with the bad ankle much of the year. “I thought it can’t be too bad because I played on it,” Samuelson said. “I knew it was bad but it was tough to accept it would take a full five, six months to get back. As much as she has a sense of urgency to regain her All-American form, she’s staying patient with as many as a 38-game schedule ahead of her this winter. Crystal Dangerfield saw the tweet from the UConn women’s basketball account on Aug. 14 of “Hey Lady Vol Hoop” with a waving hand and knew something big was up. UConn and Tennessee will play their first regular season game since 2007 when they start a home-and-home series in Connecticut in January 2020. Dangerfield, from Murfreesboro, became the first native of the Volunteer State to commit to UConn four years ago. Her teammate at Blackman High, Meme Jackson, is a senior at Tennessee this season so they will not face each other next season. The Huskies’ junior point guard grew up watching the Lady Vols. UConn will visit Thompson-Boling Arena during the 2020-21 season, the year after Dangerfield graduates. She would have enjoyed the opportunity to do it, however. “I’d probably catch a few boos, some boos, maybe more,” Dangerfield said with a laugh. Posted in Newington Town Crier, UConn on Tuesday, 16 October 2018 19:17. Updated: Tuesday, 16 October 2018 19:20.